Another beautiful interpretation of Feather Your Nest! This beautiful wool applique was just posted on Facebook yesterday and I was taken aback at the wonderful interpretation. 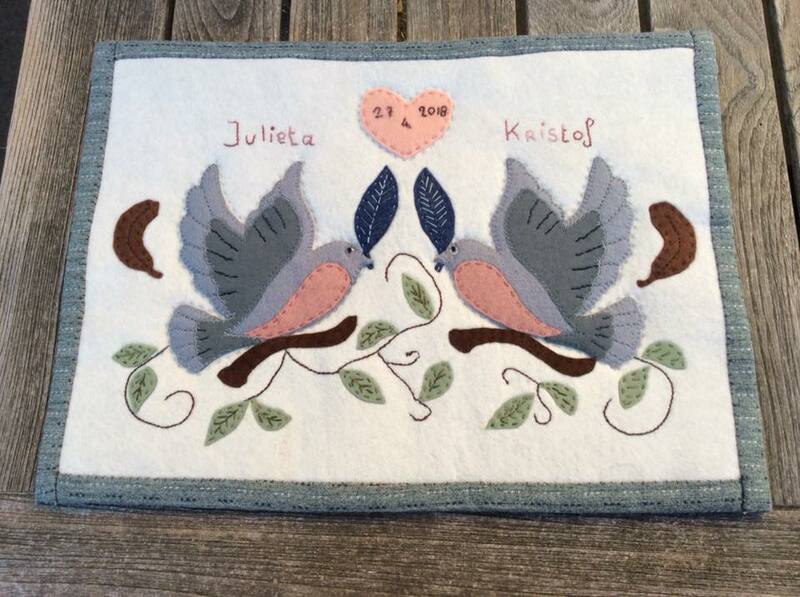 Toussein Martine used my Feather Your Nest pattern to create this custom piece as a wedding day gift and ‘remembrance’ for her son and new daughter-in-law. How lucky are they! I am always so pleased when someone has the confidence to use one of my patterns and ‘makes it their own’, especially as they pour their heart and skills into making it. Toussein chose to focus on the birds with just a few feathers and leaves – rearranging the birds to face each other (this reminded me of the wonderful ‘fraktur’ paintings done in early American art, but most certainly a carry over of ethnic designs brought over from ‘the old country’!). 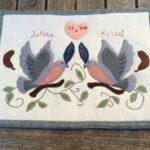 She used colors which likely were either favorites or meant to match a decor and she also carefully chose to simplify many of the patterns stitches, etc. All for such a wonderful keepsake. Sometimes it takes a bit of ‘nerve’ to learn to trust your own choices, especially if you have been convinced that you have very little artistic talent. I recently had someone ask me about creativity and whether it could be taught. My answer – “When you were two or three years old and someone gave you crayons or other materials and asked you to make something, did you refuse, hang your head and say you weren’t creative? I doubt it – ask any little one. I firmly believe that loss of belief in our own joy of creativity really has more to do with when we learn that others may judge – and we are too young or simply not strong enough to resist that judgement and pursue what brings us joy in our hearts. The good news is that as we get older we can consciously choose to ‘dig deep’ and find that lost creativity, letting other’s judgements fall to the side. While we all have different skill sets that can always be learned and improved, all of us can foster our creativity in whatever venue we choose!